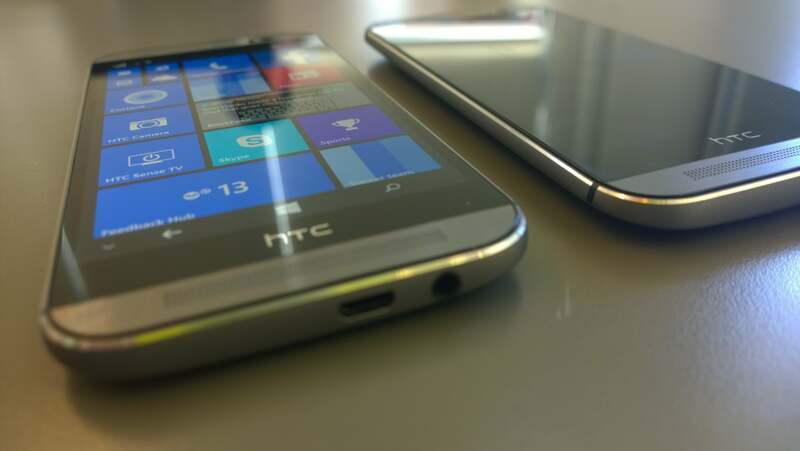 One of the worst-kept rumors in the Windows world is now confirmed to be true: HTC has brought its One (M8) phone hardware to the Windows Phone platform. 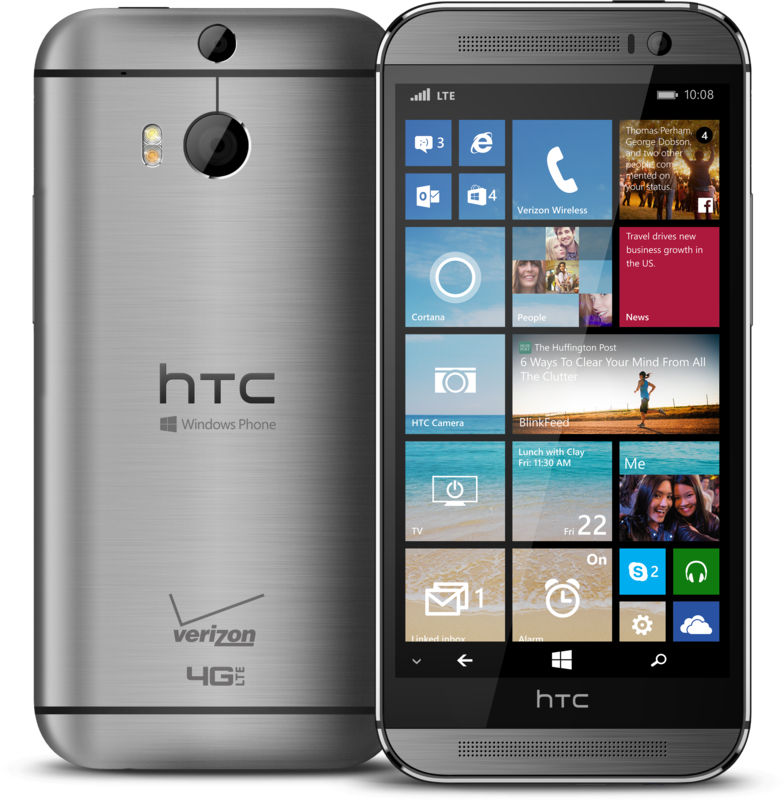 Known awkwardly as the HTC One (M8) for Windows, the new phone is physically identical to the M8 phone HTC released in April for Android, down to the millimeter. In fact, HTC seems to have gone out of its way to make the HTC One (M8) for Windows identical to its Android counterpart—within the Windows Phone environment, of course. Take a second to think about what’s going on here: For years, hardware makers sold Windows PCs, then ported Linux to them. Now, the opposite is true. The Linux-based Android OS rules the smartphone market, and Windows Phone is the operating system knocking on the door. The One M8’s metallic exterior certainly lends it a sense of weight and stability. The HTC One M8 for Windows will go on sale at noon Tuesday, exclusively through Verizon, for a promotional price of $99.99 through Verizon’s website. The phone will be preloaded with Verizon’s NFL Mobile, allowing free streaming of games, and will support Verizon Messages via Wi-Fi. Users can also pay $29.99 per month to buy the phone through Verizon’s Edge service. 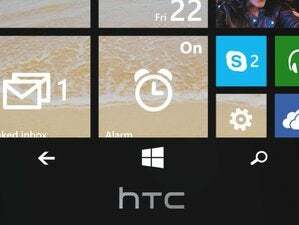 Windows Phone’s recent update will support HTC’s Dot View cover, as well. 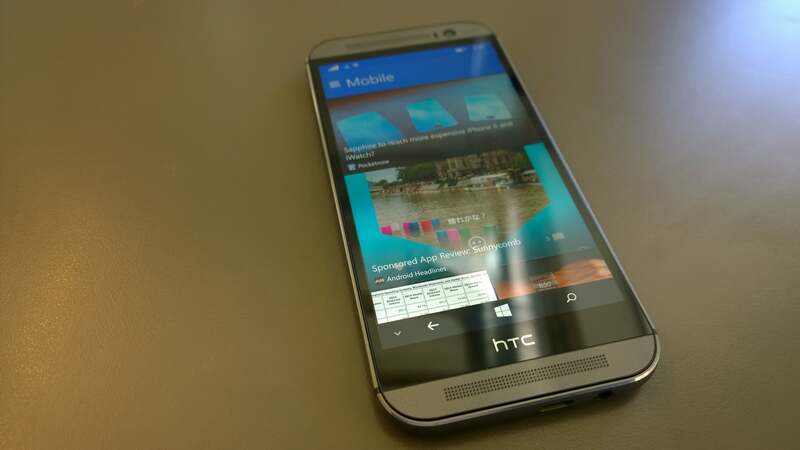 HTC invited PCWorld to try the One (M8) for Windows briefly in advance of its launch. What we found were some intriguing differences between HTC’s vision and the rest of the Windows Phone lineup, which is dominated by Microsoft’s Lumia devices. For one thing, there’s the aesthetics. The silvery, brushed-metal looked of the One (M8) contrasts sharply with the candy-colored plastic shells Nokia adopted during the time of the Lumia 925—which was virtually identical, hardware-wise, to the competing HTC 8X. 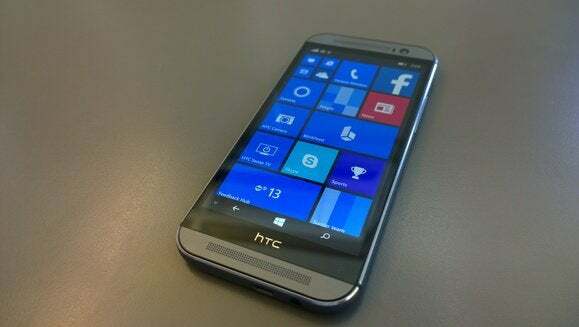 But while Microsoft picked the HTC 8X as one of its flagship phones to launch Windows Phone 8, HTC then picked listlessly at Windows Phone with a few derivative models. Meanwhile, Nokia made bold color choices part of the Lumia design aesthetic. Android? Windows Phone? Until you power it on, it’s hard to tell which is which. Remove a powered-down HTC One (M8) from the box, and chances are you’ll not even know which operating system it runs. As noted above, almost everything on the new One (M8) for Windows is identical to the Android version: its dimensions (146.36 x 70.6 x 9.35 mm; 160 grams); its display (5.0 inches, full 1080p LCD); its guts (quad-core Qualcomm Snapdragon 801, 2.3GHz; 2GB RAM; 802.11 a/b/g/n/ac Wi-Fi; a microSD slot); as well as the two UltraPixel cameras on the back, plus the 5MP front-facing selfie camera. HTC hasn’t forgotten its powerful BoomSound internal speakers, either. About the only difference in hardware is that the One (M8) for Windows will ship with 32GB of internal storage standard, as opposed to the 16GB and 32GB options that HTC offers to its carrier partners with its Android phones. The only clue to what’s powering the One (M8) for Windows is what’s etched on its rear faceplate: the Windows Phone logo, and the name of the exclusive carrier, Verizon. Power on the phone, and the differences between the Windows Phone and Android models become obvious. Instead of being greeted by HTC’s Android-powered Sense interface, you'll see Windows Phone 8.1. And while HTC’s hardware presence is obvious, you’ll need to hunt for HTC’s software apps: namely, BlinkFeed and the HTC Camera app. My first impression is you’re going to probably see quite a bit of overlap, content-wise, between BlinkFeed and Microsoft’s native Cortana digital assistant. As Greenbot’s Florence Ion noted in her review of the One (M8) for Android, BlinkFeed is now more of a full-blown news and social network aggregator. And from a news delivery standpoint, there’s some direct overlap: Cortana stores your interests in her Notebook, and you can also specify topics of interest to follow in BlinkFeed. BlinkFeed offers a very visual representation of what’s hot, however, while Cortana sticks to the basics: text. My guess is that Flipboard addicts may be interested in BlinkFeed, simply because Flipboard has yet to come to Windows Phone. HTC has kept its other software offerings intact as well, including Sense TV, which we didn't have a chance to try out. Last but certainly not least, there’s the camera. And this is where things get interesting. The camera hardware is identical to the One (M8) for Android’s: a front, 5MP, f/2.0 camera, and the paired UltraPixel cameras on the rear. The secondary camera is simply there to add depth, allowing a number of nifty perspective tricks, as well as the ability to refocus a shot after it’s been taken, Lytro style. 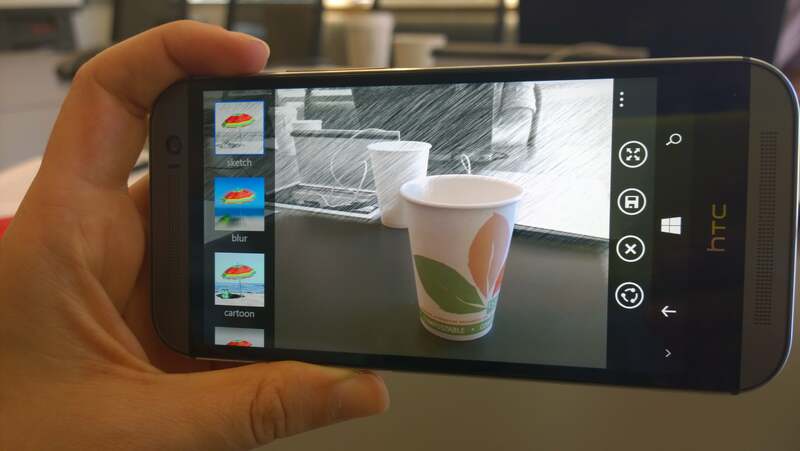 The dual camera on the back of the One M8 allow all sorts of refocusing tricks and filters. All of this works in conjunction with the HTC Camera app, which replaces the collection of Nokia software on Lumia phones. (The stock Camera app is still there, however.) However, HTC hasn't included the Zoe camera from the Android version. Suffice it to say that we could find no obvious differences between the Android apps and what HTC has built into HTC Camera, aside from the above. But Lumia owners take pride in their cameras, so we’ll definitely want to compare them more closely. One question that we’re left wondering: Will other smartphone manufacturers go a similar route? HTC wouldn’t tell us exactly how long it took to transition the One (M8) hardware to Windows Phone, or the cost involved. We do know that Microsoft actively helped, as you might expect. Porting existing hardware to Windows Phone would seem a simple, relatively inexpensive way to grow the Windows Phone ecosystem. At this point, the One (M8) for Windows is an experiment, but a very interesting one. Updated at 8:19 AM with some additional details.